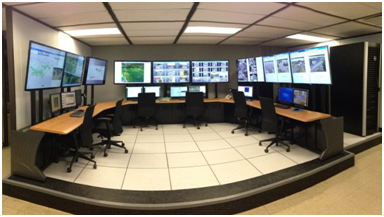 The Puerto Rico Highways and Transportation Authority has a center that performs functions for remotely monitoring and controlling traffic signal systems. Currently, the system is fully functioning for 19 traffic signal systems on PR-2 highway from Hormigueros to Mayagüez. In the near future, more traffic signal systems will be added expanding this functionality to over 50 traffic signals, including expanding the PR-2 coverage from Hatillo to Mayaguez, in the San Juan the Ponce de León, Fernández Juncos, Muñoz Rivera and F.D. Roosevelt Avenues, among others. This system provides continuous communication and monitoring for the coordinated operation of the traffic signals connected through this system. The system uses a series of video detector sensors and controllers to collect and analyze data of the traffic traveling through an intersection to optimize its operation. This data is also stored for future analysis and to modify traffic signals timing plans in the future once it is determined that a revision is necessary. This system also alerts the operators in case of component malfunctions so the operators can take remediate action and minimize the negative impacts that these malfunctions have on the transportation network.